Each of these four berries can be found in all four of Canada's Atltantic provinces, even the bakeapple (upper right) which is generally associated with Newfoundland and Labrador. Common plant names often vary by region, even by between neighbouring localities. 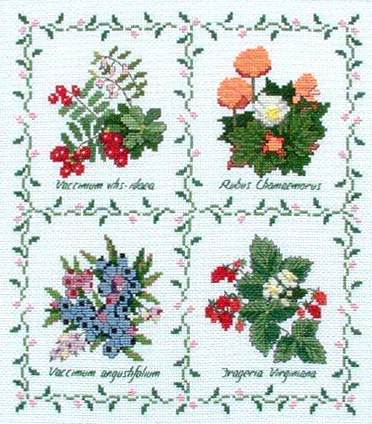 For example, our foxberry (upper left) is the partridgeberry of Newfoundland, and is also known by other names elsewhere. To further confuse us as we researched this design, there are two berries known as partridgeberry in Newfoundland. An in-house argument arose on which was "correct." In the end, Memorial University of Newfoundland Botanical Garden provided us with the answer. On the bottom - you all know these! The wild blueberry - now one of our superfoods. (Note: for health, buy only the wild, not cultivated). And the delicate, tasty wild strawberry. The designer has added the scientific names as per a typical botanical drawing. The common names have been supplied for stitching in the kit. Or, if you prefer, leave them off.